Last week, I was getting ready to leave town which meant I had to harvest all the ripe vegetables from my garden. Once I had washed and laid them all out to dry there was no question what dish I was going to make; these vegetables pretty much told me I was making ratatouille. What else would I do with onions, eggplant, zucchini, sweet peppers, and tomatoes? These are classic ratatouille fare. 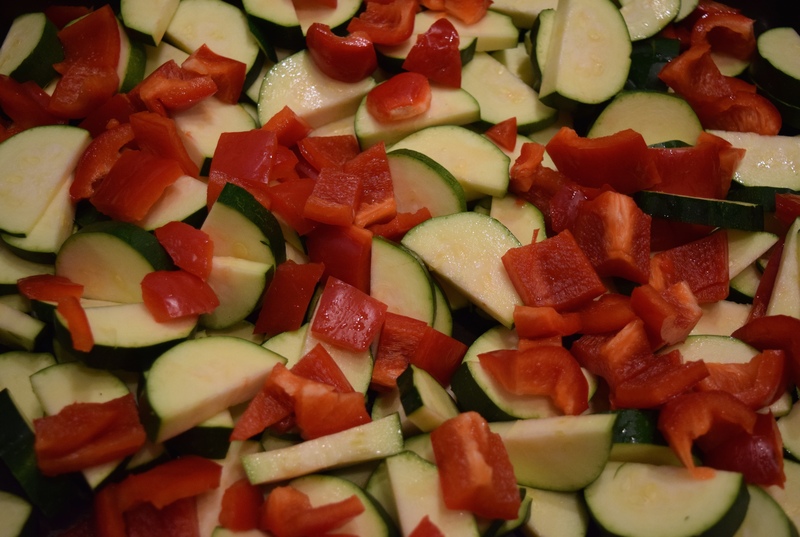 Many villages in the Mediterranean have some version of this “vegetable stew,” but it was Julia Child, who, in her 1961 cookbook, Mastering the Art of French Cooking, made ratatouille a household name. If you are a purist, you may want to stop reading here as I no longer make ratatouille using the methods that Julia made famous. 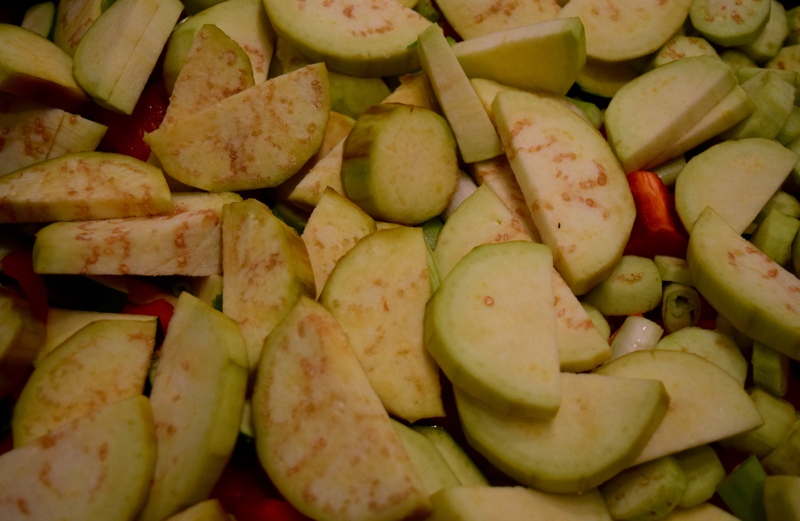 I don’t peel and remove the seeds from the tomatoes, sweat the eggplants and zucchini and then sauté them each separately, and then, layer them all together in a casserole to stew for a while. Her process took too much time. The way I chop, mix, and roast it all together, is much quicker and more reflective of today’s farm to table mentality. I think Julia would approve. Since I had a lot to do before leaving town, I was in get’ er done mode and was happy to work by myself in the kitchen. My family was watching a Nicole Kidman movie in the next room and I smiled as I listened to them tease my husband about his long-standing crush on Nicole, an infatuation that makes no sense to me; she is like a porcelain doll and I am not. My family knows my husband would secretly love to run into Nicole in Nashville. Once, my youngest son even texted him, “Quick, come to Whole Foods. I’m sitting next to Nicole and Keith.” To my husband’s credit, and since he was sitting with me, he didn’t budge. 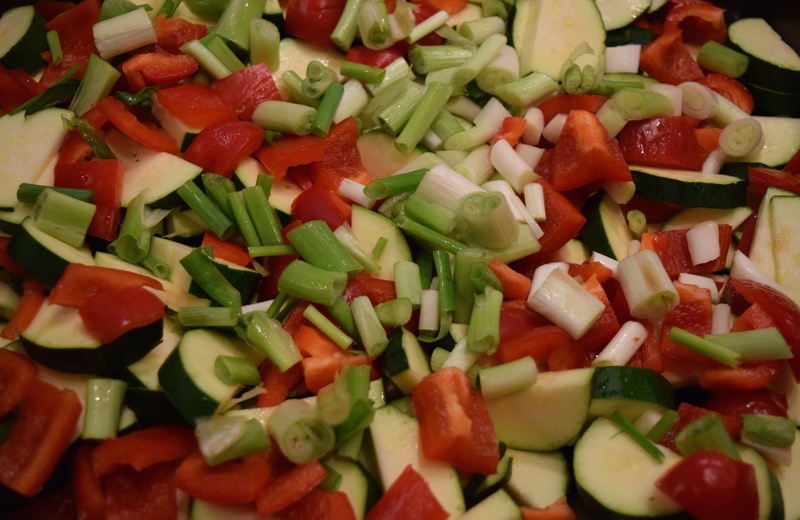 Here is my no fuss way to make ratatouille. The ingredient amounts are vague because it truly doesn’t matter. I suggest looking at the picture above and approximating the quantities from that. 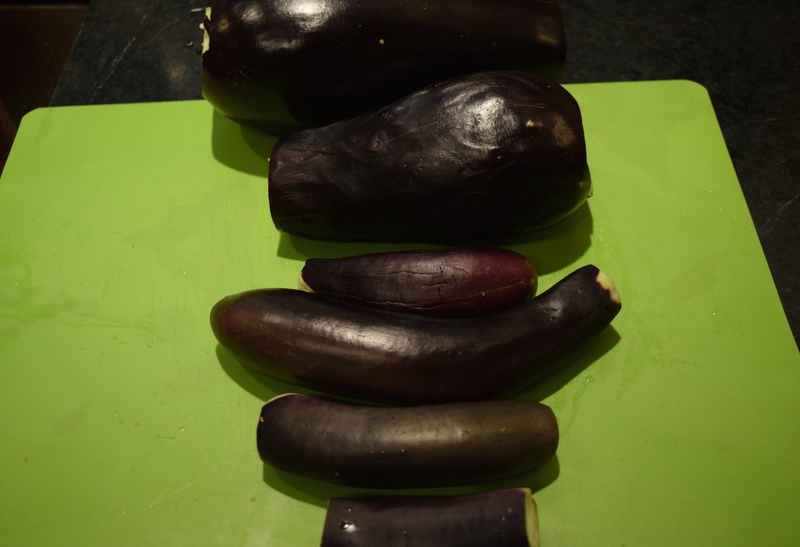 Eggplants – I used a mix of Black Beauty and Ichiban varieties. 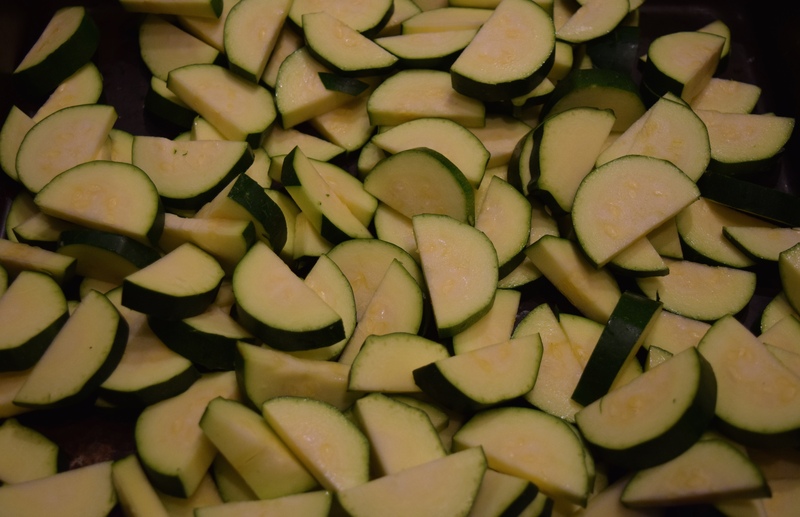 Zucchini – I used 4 thick ones. Tomatoes – I used an assortment of regular and cherry-sized. 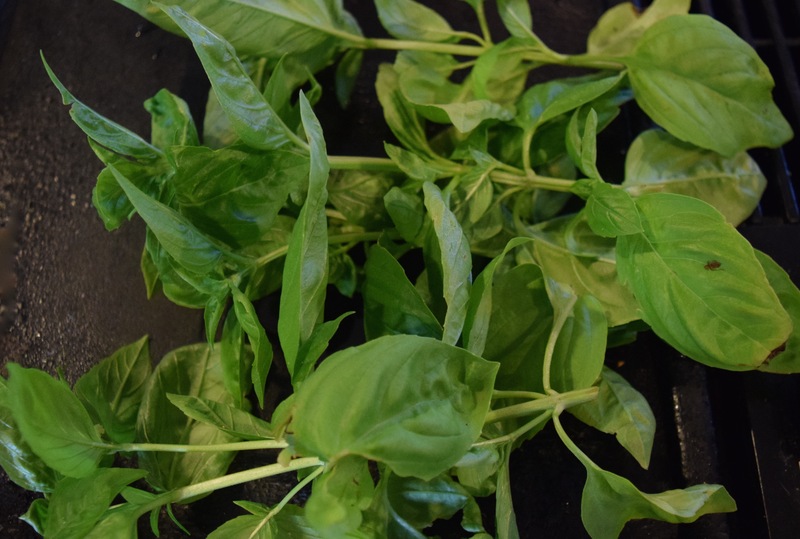 Basil – I used 4 ten-inch bushy stalks. Garlic – I used 2 heaping tablespoons of minced garlic from the jar. I prepped all the vegetables as I went along. Refer to the pictures that follow to see how. I placed them in a 13 x 16 inch Calphalon roasting pan that’s about 4 inches deep. The order of layering doesn’t matter as they will all be stirred together before going into the oven. Zucchini: leave the skin on and slice. Sweet Bell Peppers: remove core and seeds, chop into 1.5-inch dice. Green Onions: slice the white part into 1/2 slices, and the green stalks into 1-inch pieces. Eggplant: remove ends, peel, and slice. 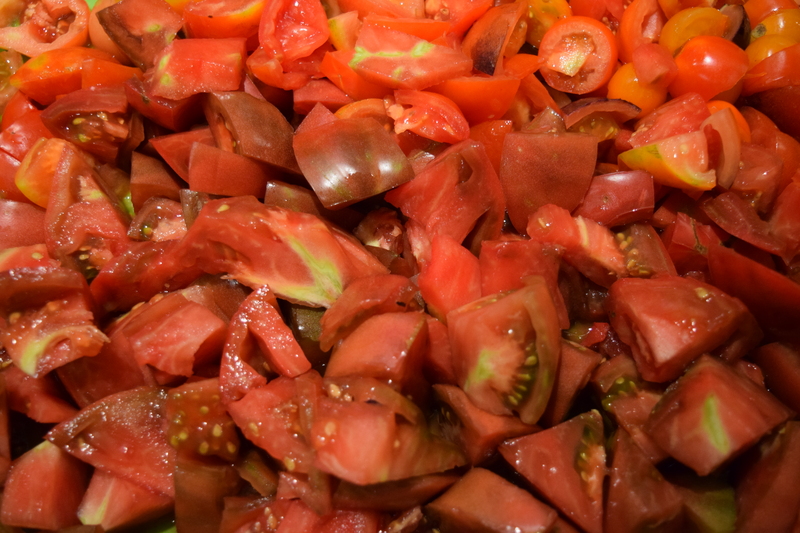 Tomatoes: remove the stem and white core, and chop as shown. No need to peel or remove seeds. 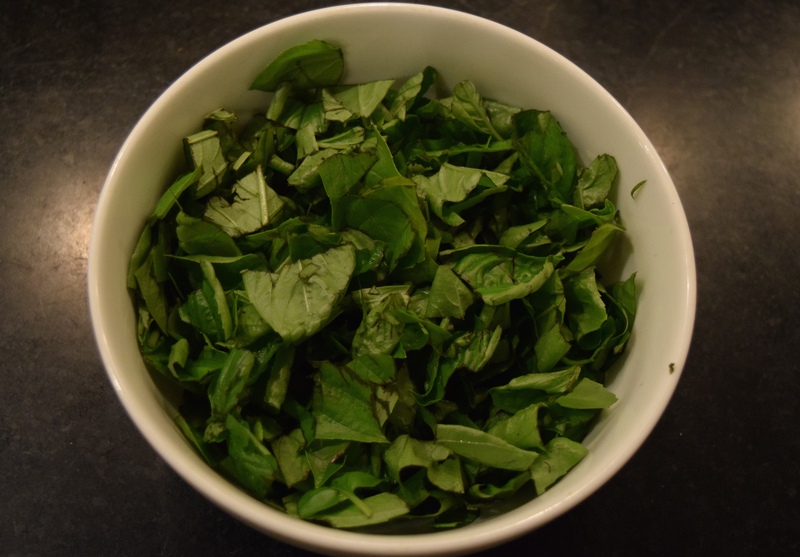 Prep basil: remove leaves from stems and chop. Add to roasting pan. Mix it all up. Add olive oil, garlic, salt and pepper. I am usually generous with the olive oil. I learned that from my mother. Roast at 400º for 40 minutes to an hour depending on the volume of vegetables used. I’ll put just about any roasted vegetable over pasta and the ratatouille was no exception. It was delicious. Be sure to sprinkle with Reggiano Parmesan. I had about 2½ quarts of leftovers that went into the fridge. My husband served it over orzo as a side dish the next night, and on Saturday morning, he put what was left in his omelette. My family loved this meal. As we ate dinner, one of my sons said, “Nicole Kidman couldn’t have made this dinner, Mom.” Thanks, son. Skip the pasta and cheese and serve it as a side dish. Yum. I thought I had an easy method (stovetop) but this looks even better. Will try with the next round of zucchini from my garden! Julia cooked hers on the stovetop! Let me know he it goes. Thanks for writing, Patty! I have to know which son said those golden lines. That needs to become a needlework sampler to hang on your kitchen wall. Thanks for this Judy! I’ve always made it on the stove top. I love your way of roasting it. I will make it your way after my next trip to the farmers market. Judy, I love receiving your emails, obtained through our church listserve. It’s amazing what you’ve done in your own yard-chickens and garden! I would love to come see it if you would allow me. Your enthusiasm is soo evident and you remind me of my Mother and her neighbors, years ago on Estes Road, having a joint garden, BUT my Mother raised the chickens. Bettye, I would love for you to come over, see the garden, have a cup of coffee and tell me all about your mother’s garden and chickens on Estes! I’m in Florida taking care of my mom now, but when I get back, we’ll do it! Did you know you could sign up to receive my blog posts in your Inbox? Just enter your email address in the “follow” box and confirm the subscription when you get the email asking for confirmation. Honestly, Craig, my mother has been roasting vegetables most of my life, so that is how I approach vegetables when I first think about how I’m going to cook them. With seven kids, it was an easier way to cook a large quantity of food. I certainly like the stovetop approach, too. About Nicole, what’s not to like, Right?! I’m still interested in trying your sous-vide method of cooking fish. When life and the garden slow down, I’m going to call you.